Between the occasional storm front, summer is gradually moving into Seattle. 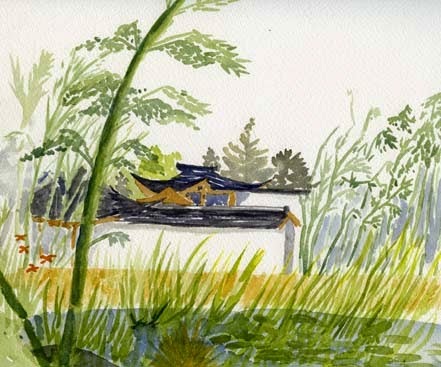 This past weekend, I took Sunday to pull some weeds and do this quick water color at the Seattle Chinese Garden. The view is from the Song Mae pavilion on the garden's eastern edge. Looking west, we peek through a bamboo grove to the Knowing the Spring Courtyard. In the foreground, a pond is filled with iris and water lilies with orange day lilies perched on the bank.